Have you ever met a showboarden athlete who wants to get his talent and a dose of reality? Well, you are lucky. 25-year-old French boxer Sabri Sediri had a match against Sam Maxwell on Saturday at the Leicester Arena. In this extremely light fight, Sabri was in the finals and very confident that he was on his way to victory, and began to relax and dance to his opponent. 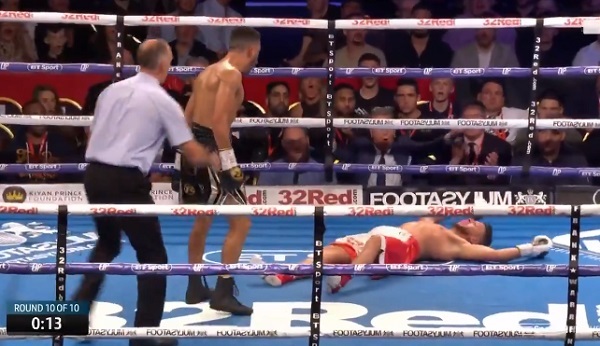 His carelessness and show-boarding cost him as Maxwell everything landed a well-timed punch that put Sabri on his back and could not recover in time before the referee called the fight. Sam Maxwell lost and was mocked by his opponent, and he did that 10 seconds before the end! The last second win brought Maxwell the vacant WBO European Super Lightweight title.